Adorn your steamer trunk with our attractive antique brass locks, catches, corners and real leather handles. I would definitely recommend this kit! Very good quality. I am completely happy with it. Thank you Rockler? I have to say it is just a box tell after you add the hardware. Then it becomes something very special! This was an old trunk that was half wood cover with rotten cloth and the inside half old wall paper. 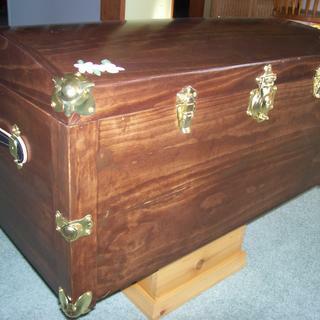 I repainted the metal and covered soft pine with cherry veneer on the outside and in the lid. Stained walnut stirps and coverd inside with fabric. Last touch was adding the hardware pieces and it is on 3/4 inch wheels. Hardware set and cherry veneer. So very cool! Really completes the look! Nice Finish and Easy Install! Worked great. Have to bend the top corner pieces to fit but this was no problem with straps. I installed the trim kit for a pretty plain crate and it looks great, I would purchase these again. Plans worked out well with a few changes. Made two out of cedar and black walnut bands. 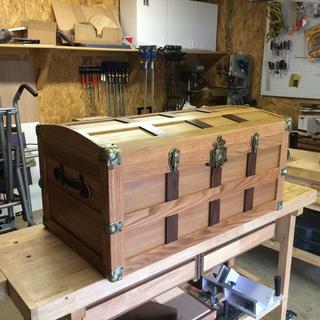 The hardware fit well and made the chest complete. Thanks Rockler! First time builder and love it with many compliments and plan to make more. 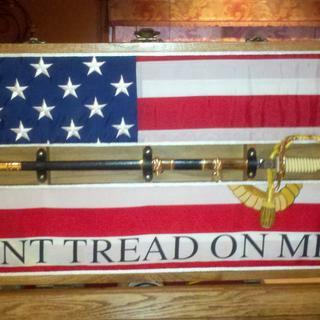 Using Rocklers pre-packaged antique brass hardware put the finishing touches on my steamer trunk. 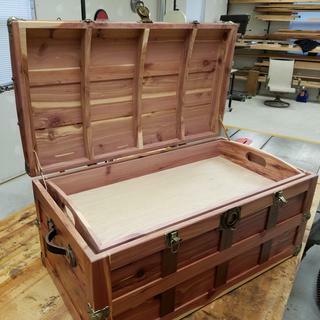 Initially bought the plan and kit to make a simple chest/trunk to use as a go-by. 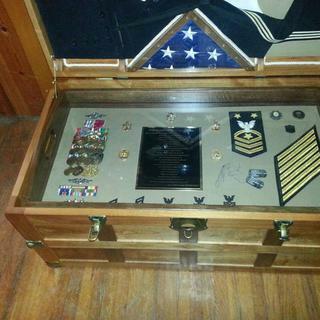 Since then, I have made numerous chests and decorated as military shadowboxes. Have altered slightly here and there for different types of joints and displays. Great product!! Better than what we were expecting, frankly - high quality, solid and will last for a long time. A vast improvement over hardware ordered from a few other companies - with Rockler, what you see IS what you get. And excellent customer service is a plus. Very pleased. 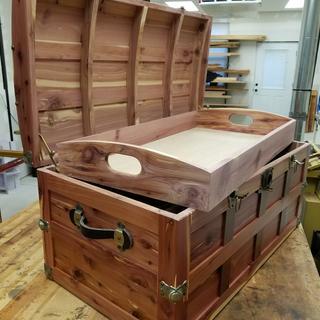 I built one chest 12 years ago for my first granddaughter. I knew the product was excellent. was not disappointed on this order. 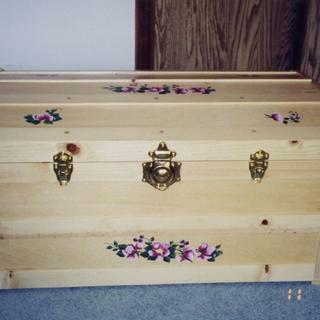 I built three for each of my granddaughters. I milled some birch and black walnut from my property. 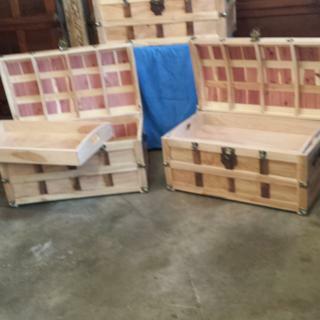 I have made regular size trunks ,but decided to add a little more height in the last couple I have made. Quite pleased with the Hardware kit. 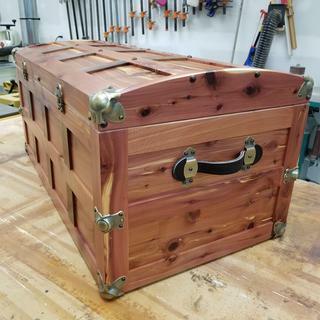 I've changed the trunk design a little bit, but I have made 13 trunks and have used this hardware kit on each one. Makes a good looking project. Hardware looks great on the trunk I built. Shipped fast. The hardware looks very good when installed, however more attention to detail should be given to the corner trim located at the arched top section to provide a better fit. 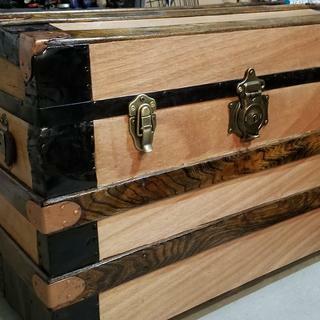 I ordered this kit for an antique looking chest/card box. Overall the kit worked well and looks great, however there are a few things to note. The finish on the hinges is nothing like that of the rest of the hardware despite being labeled as the antique brass like everything else. I brought this to Rockler's attention and they seemingly knew of this problem before - they were nice enough to refund my money for the hinges so I could get others. The lid supports as described in the details are brass, so be aware of that as well. I give it 4 stars just because of the mismatched finishes. Although I have not had a chance to nail them on to my trunk, all parts were there and were compatible with what were on there. Also, Rockler was good in keeping me posted on what thew delivery date was. Buying as a total package makes it easier for shop inventory and handling. Good to have the screws available with the hardware. The antique colors vary among the locks. hinges and corner pieces, sometimes a dramatic difference. Good kit. Only negative is the hinges need to be beefed up or switched to a strap type. Today's steamer trunk hardware is rather cheaply made but the antique stuff isn't all that great, either. This kit was acceptable. I did not like the lid stays supplied with the kit...they were just too cheasy. I recently purchased these plans and build my grandson a trunk for Christmas. It turned out beautifully, but there were some problems with the plans that were minor. The finished product is beautiful though, You must have a a good table saw, a bandsaw, good circular sander, and various other tools. Must use good lumber, and pay attention to the sizes. When it says a 2" board, it means a 2" board. 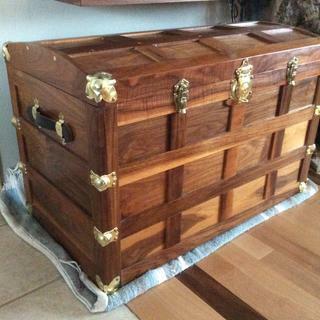 I used oak and walnut, and materials were around $300.00. Will make another next year for my granddaughter. the kit itself is WAY over price, especially when you throw in shipping cost. the hinges in the kit were JUNK could not-would not use them ( very unsafe ) had to buy different ones, added to the cost. I probably will not buy this kit again. It was worth the effort to build, results are satisfactory. The templates did not always match the cut list, and some techniques in the instructions would be very difficult to accomplish. But, with some past experience these short comings were overcome. End result is a fine piece to have. the hardware was not bad, but the warning of lead exposure was unsettling; a wood worker has enough hazardous dust exposeure without having to deal with exposure to lead in the hardware. The latch was not buffed and had runs of tarnishing fluid on it that detracted from its appearance. Also at that price the kit should have come with installation instructions for the hardware. This plan is rated as easy but my experience would rate it higher, especially given the design of the lid. 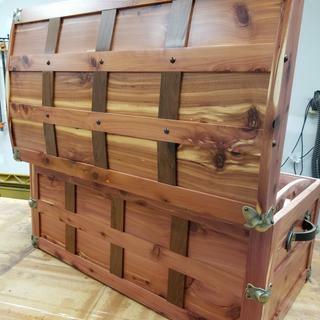 I just finished this project for my 16 year old grandson and he loves it. I like the Chest but the hardware is cheap. Very poor quality. The "antique" finish is highly variable among the set pieces. The metal is flimsy. The leather handles arrived with a stitch or two busted. If I wasn't working with a time frame I'd return and ask for a refund. As it is, I'll just refinish the pieces myself with a sandblaster and resew the leather. Pretty disappointing. Unfortunately, the steamer trunk hardware kit provided parts that were too large for the steamer trunk I built. I used standard 1x2 oak in the construction and those pieces turned out to be too small for the mounting of the latches, hinges, and lock. The pattern I used called for two-inch pieces. So I had to return the kit to Rockler. The good news is when I returned them to Rockler, they promptly refunded the charges. Thanks, Rockler. I will be back. 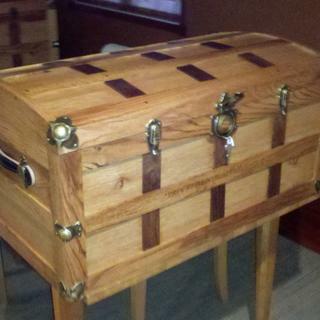 My fourth cedar chest for graduation . 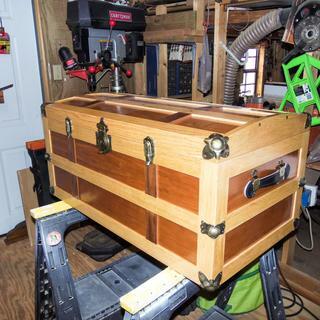 I am making a steamer trunk for my granddaughter and need the hardware. 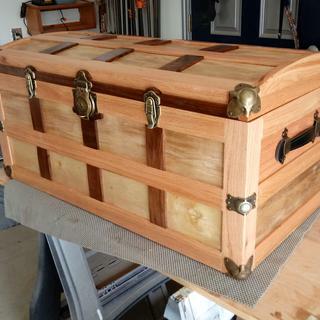 This will be my fourth trunk made for gifts. 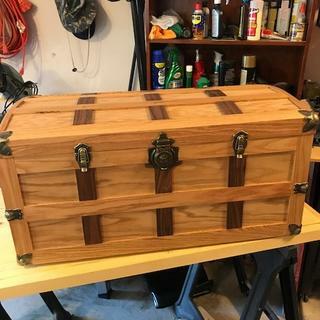 I have refinished older trunks. I wanted to use Antique Brass on the trunk I'm making and distress it a little. See how it looks. I wanted to be sure all of the hardware I picked matched in color and style. 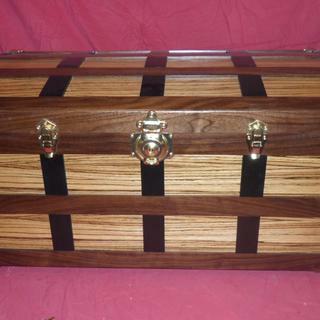 I have made 6 of these steamer trunks and give them as wedding gifts. Let others give a blender or steak knives, I give them a truly unique gift that will last a lifetime. This antique brass plated hardware kit really finishes off my woodworking. we have used this product before and were very pleased with it. 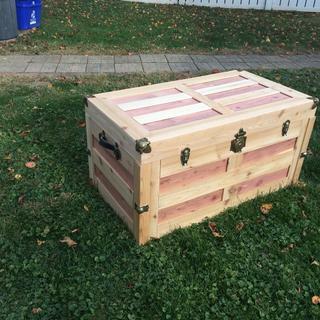 Building a steamer trunk for my daughter. By far the best hardware for the best price around. I have purchased several of them in the past. Great price for the kit . Have ordered from Rockler before and satisfied with past purchases made . 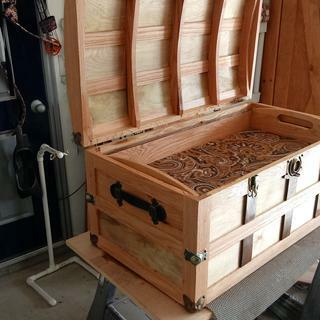 Building a antique looking trunk and your products are quality. 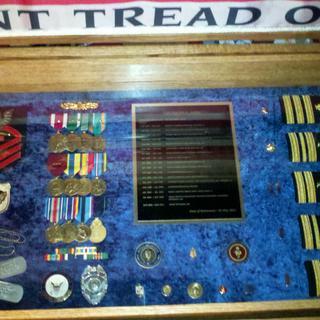 I have made these trunks before and used this hardware. My husband is building me a trunk and we found this hardware kit to accent our new piece. you were the only store or site found that had all the pieces in one kit. Because I knew it included all of the parts as opposed to me finding them individually. I have done several of these for family. Very happy with results. 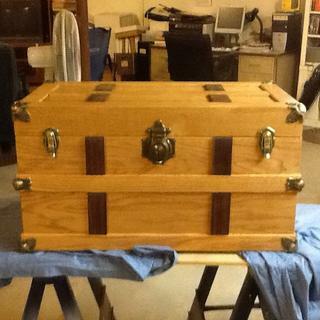 The trunk is a gift for a friends boy who just earned his eagle scout. This will be a graduation gift for my grand daughter. Built this 20+ yrs ago for my daughter, now its time to build one for my grand daughter. 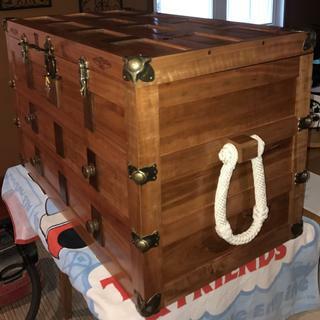 I made a steamer trunk for my grandson and he loved it. I plan on making a couple more. I liked it when I bought it before. 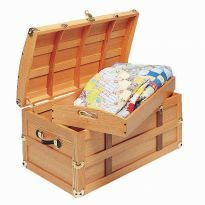 I have used this kit for other trunks that I have made and they add a nice touch. 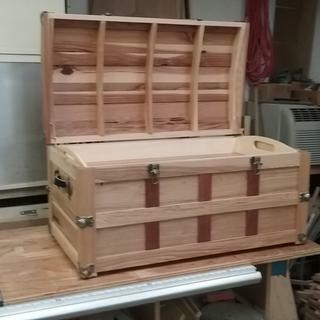 Built a trunk needed hardware for it knew Rockler had it. I am making a steamer trunk and a friend suggested I go to your website and order this kit. he uses your products and they look great. I have built a steamer trunk and needed the hardware. Glad you had a kit. I got the plans. These seem to fit. Thanks for letting the wood whisperer do a video. It's very helpful for us rookies to have video help. The words... they dont' help so much when you're new. 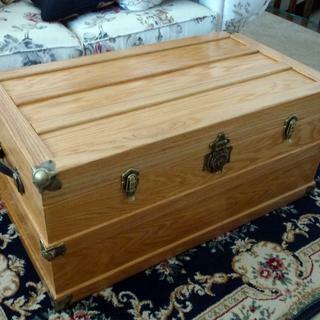 Have built this trunk before for grandsons. More grandsons mean more trunks! 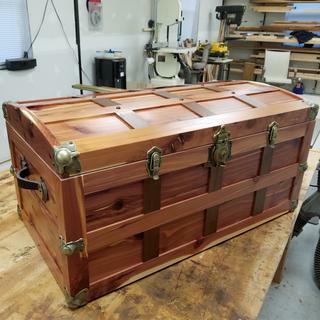 finishing a trunk my wifes uncle started. Have ordered this set before and really like it.. I had plans to build an end table, haven't started it yet. The corner and side cap hardware seems somewhat compressed. What is the best way to get them to fit properly? BEST ANSWER: I spread them by hand. I have also just simply pushed them on, marked and then drilled pilot holes before finish sanding. I used a rubber hammer to shape them over a scrap block of wood. What I do is kind of center it and then place one screw in and then use a rubber mallet to tap one of the other sides to place the second screw and then the last the last screw which is the bottom or depending where you are and they all seem to center themselves and they look good. Set the fitting onto a block of wood and tap with a leather or rubber hammer until it fits correctly. If its too poorly made by the manufacturer, return to Rockler for a replacement. I'm sure Rockler stands behind their own products. What exactly does this mean and is there something else I need to but separately? "(2) pair Unpinned Loops with out brad"
BEST ANSWER: The leather strapped handle slides out to make a loop. If you push it in it lays flat. In the picture is it pulled out . Screw the brass hardware to the side in the leather handle fits in side the hardware. Pretty simple. It’s an awesome trunk. That refers to the handles. Nothing else needed. I've used them a couple of times and they are great. Can I just buy the handles? I Mike, sorry i don't know. I bought all the hadware kit. Any one ever consider using a compression piston similar to automotive hood stays to protect lil fingers from harm? Wonder if they are sold at tickler? BEST ANSWER: Did not consider compression lid support because a pair of supports was provided. When lid is opened both lock in pretty tight. If one should be unlocked the other is strong enough to support the lid on its own. I modified the plan and made the truck lid flat. 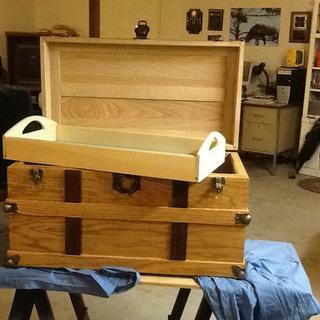 Then I added a tempered glass top to turn the trunk into a coffee table/storage trunk. A single lid support still handles the added weight. Good question. Don't know how well it would work in wood. There would need to be modifications made as the tolerance is tight by the tray inside. Good luck. does the kit come in anything other than antique brass? Perhaps nickel?